I recently spent two days participating in a high level strategic thinking workshop for a higher education institution. All of the people present were dedicated disciples of the Lord Jesus Christ yet each of us had our own views, priorities, and agendas. We achieved a lot yet, at the end of day , we could not honestly say that we were of one mind. When the Holy Spirit breathed life into the very first church on the day of Pentecost, the Bible describes the 120 or so believers as ‘all together in one place’. The word ‘together’ here means that they were gathered as a group in one place but in Acts 1:14 a similar word indicates that they were of one mind and accord. In other words, they were in agreement with one another. When I met with my colleagues to strategies a way forward, we were together in one place yet we were not in one accord. Anyone who regularly attends church committee meetings or institutional board meetings will understand that there is nothing unusual about it. What were those early disciples likeminded about? Doctrines had not yet been established and there were no systematic theologies in existence. However, they were in one accord concerning at least three things – Jesus, His promise, and their community status. They were devoted to Jesus and they were committed to each other as fellow disciples of His. They were also clear that He had promised that in a short while the Holy Spirit would come and breathe life into their little community. Revival appears to bring about this sort of relational unity. 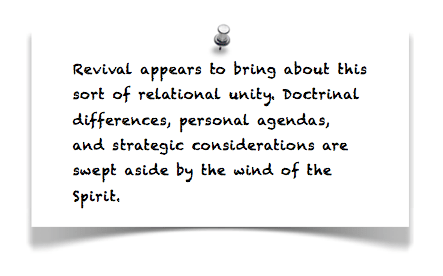 Doctrinal differences, personal agendas, and strategic considerations are swept aside by the wind of the Spirit. Instead, the palpable presence of God in the church brings about a unity of heart, mind, and spirit around three central beliefs – the centrality and lordship of Jesus, the authority of the Word of God, and dependence on the leading and empowerment of the Holy Spirit. Revival brings unity and unanimity to all who hold to these foundational concepts. If you believe in these three foundational truths, the revival will most likely bring you into wonderful accord with likeminded believers. So come O Lord and revive your church!